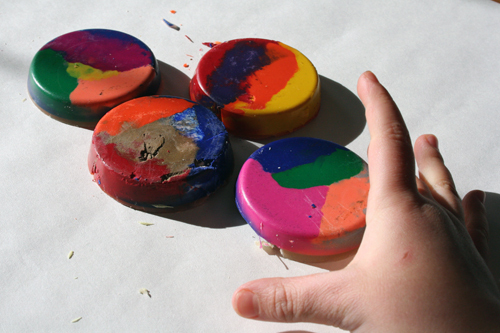 What do you do with all the bits and pieces of broken crayons left over? I use to throw them out but lately I've taken to melting them down into another art form for the kids to experience. It's quite simple actually. 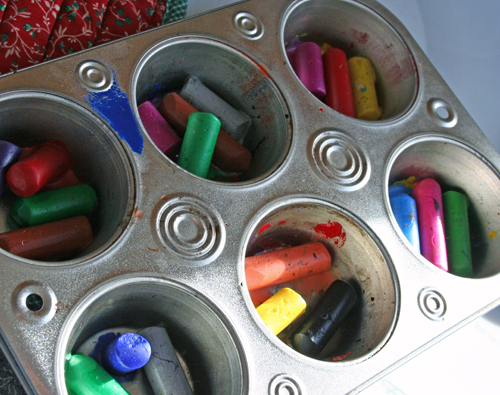 Heat your oven to anywhere from 200-300 F. Take an old muffin tin (option: you can add foil cup cake liners) and let the kids put the crayons in the compartments as they desire, just make sure there are no bits of paper left on the crayons. Put them in the oven and watch them melt. After they have completely melted, take them out of the oven and let them cool. Use a small paring knife to help remove them from your muffin tin if you aren't using liners. I recommend using a muffin tin that doesn't get used for baking at all. Watch your preschoolers with these crayon cookies, they look almost good enough to eat! That's so funny, I was planning on doing this this weekend, but we never made it past the collecting the crayons part.